These Monitor Stands For Professional Use are Some of our Most Popular Models! Ready to Ship Today From Our Massive Inventory! Bracket compatible with 100 x 200 & 200 x 200 VESA included, for holding a 23" to 30" TV. Tilt bracket allows you to angle television at appropriate angle. 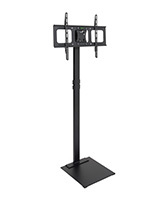 These monitor stands, also called an LCD stand or a plasma stand, are shipped with a 200 x 100 VESA mounting bracket, capable of holding a television from 23" to 30" that weighs less than 50 Lbs. VESA brackets are standard, and their mount will fit most televisions. 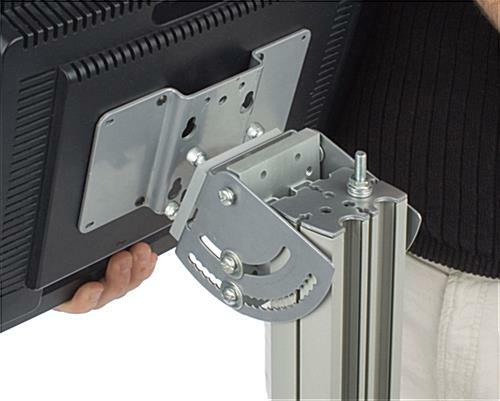 We include the necessary hardware to mount most televisions on the bracket. However, certain televisions will need other screws that you can obtain at any local hardware store. These monitor stands have a tilting bracket for angling your flat television screen to ensure the best possible view of your display. 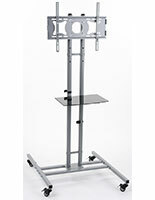 Trade shows, retail stores, and malls will find these monitor stands to be a great marketing tool. 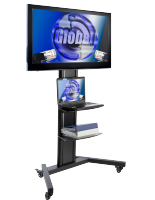 Flat screen displays, monitor stands are a great eye-catching alternative to traditional poster stands. This LCD floor mount, television bracket is the top selling unit suited for your Panasonic. 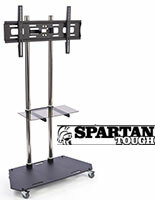 These monitor stands can mount a 23" LCD screen for optimal viewing of your displayed images, video or live cable. This LED mount is VESA compatible making it ideal for Panasonic televisions. 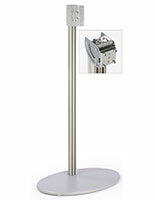 Mounting a 23" Panasonic TV to this stand will captivate the attention of passersby, drawing them into your display. This LCD television bracket can be displayed in many locations and will appeal to a wide range of people and potential customers. 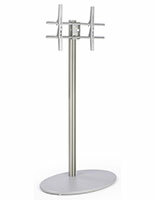 These monitor stands, like a plasma stand and an LCD screen stand, use a hollow pillar to hold up your television. You can place the wires for the TV through this pillar, hiding them from passersby using four (4) plastic strips, and keeping the upscale look of the display intact. These monitor stands have a wide base that helps provide stability for your display. 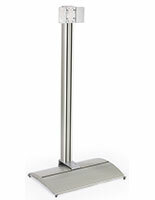 These plasma mounts, monitor stands have a satin silver finish, and are made from brushed aluminum. 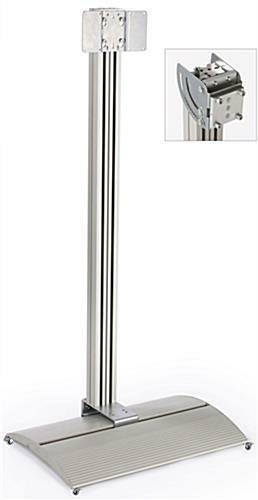 The durable aluminum hardware holds up in high traffic locations, making these perfect monitor stands for busy marketplaces or high volume trade shows. These flat screen stands are the perfect monitor stands to show your customers products or valuable business information in an exciting way.